We invite you to join us from 5:30 - 8 pm on Thursday, May 16th as we welcome Jeffrey A. Damaschke PT, DPT, PhD, Board Certified Orthopedic Clinical Specialist to share his knowledge and expertise on "Introduction to Nutrition in Clinical Practice for PTs and PTAs. " This program will introduce the PT and PTA to basic concepts of nutrition that can be used clinically to comprehend the importance of nutrition and to educate patients about foods that can improve their health and wellness and decrease their risk of chronic disease. As PTs and PTAs we should understand the functional application of nutritional information when treating patients with chronic conditions such as obesity, hypertension, hyperlipidemia and type II diabetes. Being able to educate patients on what types of foods should be consumed in greater quantities and what types of food should be consumed in lesser quantities can assist them in improving their overall health and wellness. Discuss appropriate quantities of foods and nutrients that should be consumed. Jeffrey A. Damaschke PT, DPT, PhD, Board Certified Orthopedic Clinical Specialist: Dr. Damaschke received his BS in Physical Therapy from The University of Texas Medical Branch; completed his MS in Physical Therapy with an emphasis in orthopedics in 2003 and his Doctor of Physical Therapy in 2004 both from Rosalind Franklin University of Medicine and Science. In 2016, he completed his Doctor of Philosophy from Cardinal Stritch University in Milwaukee, Wisconsin with a degree in Leadership for the Advancement of Learning and Service in Higher Education. His dissertation focused on the assessment and acquisition of knowledge related to prevention, health promotion and wellness in the health professions. Dr. Damaschke’s clinical practice has been performing primary musculoskeletal care and prevention, health promotion and wellness within the United States Navy for 20 years. He has presented at the Association of Schools of Allied Health Sciences national meeting; Illinois Physical Therapy Association (IPTA) conferences, American Physical Therapy Association (APTA) national meetings, and APTA Combined Sections. 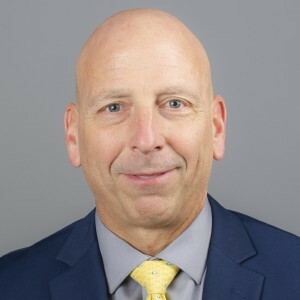 In addition, he has given a variety of invited presentations in the community and continuing education programs in the areas of musculoskeletal kinesiology and functional anatomy, health promotion and wellness, primary musculoskeletal care, diagnostic imaging for rehabilitation specialists, and differential diagnosis. Dr. Damaschke is a Board Certified Orthopedic Clinical Specialist through the American Board of Physical Therapy Specialties. He has served on the APTA Awards Committee, was the Vice-President of the IPTA, an Illinois delegate to the APTA House of Delegate and on the IPTA Prevention, Health Promotion and Wellness Task Force and Committee. He is currently an active member of the APTA and IPTA and serves as the IPTA Secretary on the Board of Directors. At the University, Dr. Damaschke serves as the Vice Dean in the College of Health Professions, is acting Chair of the Department of Physical Therapy, is an active faculty member teaching in the Doctor of Physical Therapy program in the areas of prevention, health promotion and wellness; orthopedics; kinesiology; anatomy, anatomic imaging; and physiology. He developed and implemented RFUMS’s inaugural health promotion and wellness initiative-Healthy U and co-chairs the Healthy U Wellness Council.